Over the years, we have beseeched LifeWay’s managers to read A Time of Departing andFaith Undone. We sent the books to some of them because they are well documented, non-vitriolic, and correct in their assessments as to what is happening in the church today. We realize that for them to remove all contemplative aspects of their store, their shelves might be sparsely filled unless they turned to biblical publishers. The problem with much of organized Christianity today is the cost is too high and the loss financially too great to make these changes. But the eternal cost of NOT doing what is right is far greater, and the implications could be staggering. This entry was posted in Emergent Church, LifeWay, SBC, The Expositor on 15 February 2011 by theexpositor. On Christian Post.com recently, Perry Nobles, pastor of NewSpring Church in Anderson, S.C, wrote a column entitled 3 Arguments that Sound Spiritual but Are Actually Stupid. I offer my response below. Uh…OK, the problem with this argument is…a hospital IS a business…and if it is not ran properly then it will have to close its doors, thus losing its effectiveness in helping those it has been called to reach. Like it or not in church world today leadership matters. God made sure we knew that leadership IS a spiritual gift and the reason it has been given was to help the church be more and more effective. I personally believe the church should be the best ran organization on the planet because God has gifted and called leaders to lead AND filled them with HIS Holy Spirit so that they can do so. MIKE:First of all, the church is not a hospital. A hospital deals with sick people. The lost, the sinner isn’t sick, HE IS DEAD! Secondly, the church is not a business like a tire dealer is a business, and God does not intend for it to be operated like a business. It is the Church of Jesus Christ and He is the head of it, He empowers it and it should be that He directs it. Sure, He appoints men to lead, but that’s only because He chooses to do that, not because the man decided one day he wants to be a pastor and “run” a church. The Church will thrive based on our dependence and obedience to Christ and His commands, not on our ability, skills, talents or resources, and therein lies the problem; mortal men thinking they are more sovereign than the Eternal God. Uh…so what’s the opposite, chasing uncool, boring, predictable and meaningless? Sure, churches can go off the deep end and worship creativity rather than the Creator. But to say that a church should not embrace creativity and innovation and leverage them for the use of the Gospel is insane. Church should not be a place where people come and see what life was like on this planet during the 1960’s and 70’s…but rather a place where people encounter Jesus Christ and the preaching of HIS Word in an environment in which they understand. (One does NOT have to be sacrificed for the other!) We are created in God’s image and called to be like Him…which means that we ARE creative beings. Somehow I believe that the church is supposed to be reaching kids WAY better than Disney…they have a mouse…we have the MESSIAH who gave His life and rose from the dead. Our message is SO much greater and should be told in the most effective way possible. MIKE:I agree with Noble statement regarding the church “a place where people encounter Jesus Christ and the preaching of HIS Word in an environment in which they understand.” However it must be noted that if an erroneous Gospel is being preached or a “half gospel”, it doesn’t matter how creative the production is, it is just a messed-up message wrapped up in a slick presentation. His opening statement “Uh…so what’s the opposite, chasing uncool, boring, predictable and meaningless?” lends me to believe that he truly does overly focus on what’s “cool and relevant”. Again, the Gospel is the Lord’s. It is HIS Gospel, not ours. He is the sovereign Lord of all and did not need our help to His plan for salvation, and does not need our help to see it through in the lives of people. We are blessed and privileged to have ANY part in proclaiming His Word. Does Noble and others of like mind believe that God is God, that He is able….or don’t they? This one always cracks me up because, well, I happen to like shopping at Buckle (they actually have jeans that fit me!) I am not so sure about the dressing cool part…but I really do like their clothes. Honestly, I was not aware that surrendering to ministry meant that I also had to surrender to the pleated/cuffed khaki, sweater vest, comb over club! (We could really go back and forth all day on this.) Bottom line…there is a WAR going on for the battle of the souls of men and women…and fighting over clothing styles should not be a fight we dive into! Dress how you like to dress…and if others want to obsess about it you should feel sorry for them and not fight with them. MIKE:I for one do not fight over the style of dress or even the style of music so much. I do fight over the content and commitment to the Gospel and God’s Word. I live a western/cowboy type lifestyle, but I don’t attend a cowboy church; not because that in and of itself is bad, but because most of the cowboy churches I have attended make hats, boots and hay bales a major theme. We are in a war and its mean, ugly and bloody at times….but here is the thing….we are mere soldiers in this fight with no authority or ability except that which is granted to us by the Supreme Commander, the Lord God. The cause is His, the battle plan is His, the weapons are His, and the resources are His. We either submit and obey His commands or we, individually fail. Noble, Warren and the like do not acknowledge or even imply that apart from the grace and mercy of God, we have not desire or ability to seek or please Him. It’s not about our living to succeed; it’s about our dyeing to live in Him. Don’t hint at it gentlemen, say, show it, live it, preach it! This entry was posted in American Christianity, Compromise, Emergent Church, Postmodernism, The Expositor on 13 August 2010 by theexpositor. This from Wretched with Todd Friel…via CRN. Thanks to all. This entry was posted in Emergent Church, Todd Friel on 16 June 2009 by theexpositor. This entry was posted in Apologetics, Contemporary Preaching, Emergent Church, Five Solas, Ken Silva on 17 January 2009 by mcp. Rather than labeling Mars Hill as an emerging church, he calls it a Christian church and points to only two things he and the church really care about – Jesus and the Bible. 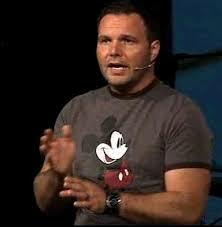 This entry was posted in Emergent Church, Mark Driscoll on 28 February 2008 by theexpositor.